Last night I was in the basement doing laundry. Caroline called down from the second floor where she was giving Jay a bath: “You need to see what Wally’s doing in here,” she said. I abandoned my pile of sheets and towels and trudged upstairs. The sounds of happy commotion grew louder as I approached the bathroom door—shrieking, laughing, I could barely tell who was who. Inside Wally was holding onto the edge of the tub, supported by Caroline, and Jay was sitting in the bath. “Do it again so Daddy can see,” Caroline told Jay. Jay filled a cup with water and counted to three. Then he tossed the water up in the air. Wally shrieked with delight. He let out a deep belly laugh that rolled on and on—I had a hard time believing that that someone with only 7-months in the world could experience such outsized delight. The bath came on a quiet Monday evening at the end of a long weekend on which three close friends came to visit. On Saturday Julie, Eric, and Kate flew from New York to Detroit. We spent the morning (and much of the week) anticipating their arrival. Julie introduced me and Caroline ten years ago, and more recently was asleep in our apartment the morning Caroline went into labor with Jay. Eric and I met twelve years ago on an orientation camping trip before our freshman year of college. This was going to be our first time seeing him and Kate since they announced that their first child is due this June. Earlier in the week Caroline said that she was particularly looking forward to sharing Jay and Wally with our friends. Family life can be insular and the personalities of little children are hard to convey at a distance or out of context—Jay is funnier, more talkative, and more creative at home where he’s got the lay of the land. So many of the most meaningful experiences in our lives take place where no one else can see them (just as it is with most people’s lives); we were excited to be able to bridge that gap for a weekend. 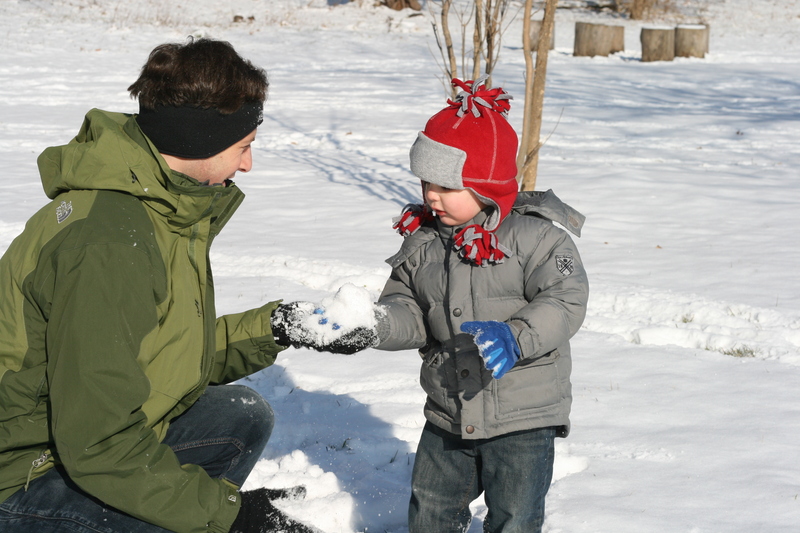 Eric teaches Jay how to make a snowball. And to their credit, our friends were up for the experience. They got down on the floor and played “mechanic” with Jay, helping him fix his endlessly broken fire truck; they indulged him in countless rounds of the “diner” game where Jay handed them a copy of The Brothers Karmazov, which was meant to be the menu, and asked them what they wanted for lunch; they bounced Wally when he was fussy; steered him clear of choking hazards as he crept on the floor; and helped us shoehorn him into his winter suit when we went out for a walk on a cold Sunday morning. For Caroline and me, the weekend conjured feelings of utopia. 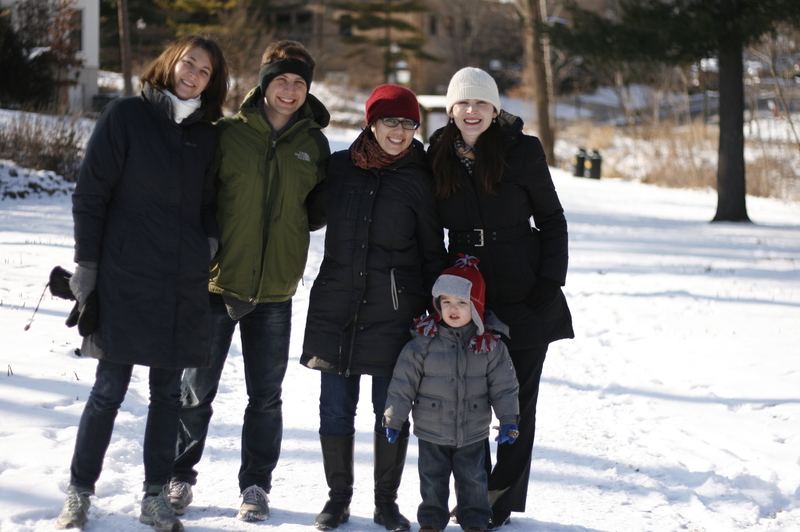 It turns out that 5-adults-to-2-kids is just about the perfect ratio. And after Jay and Wally went to bed we squeezed into a weekend more adult fun than Caroline and I sometimes have in a month: We went out to dinner on Saturday night while a babysitter watched the boys*; on Sunday Eric and I went to a bar to watch the Giants-Packers game; and Sunday night we stayed up late drinking vodka cocktails and talking about what it means (or whether it’s possible) to respect other people’s life choices that you disagree with. In the course of 48 hours we settled into a rhythm that, to me at least, made our time together seem longer than it was, and which made our house seem particularly quiet when we walked back inside after waving goodbye in the driveway on Monday morning. I knew the weekend had felt good to me and Caroline, and that night, as I was pulling the sheets off the guest bed, I wondered how it had felt for our friends. Every home and every family has its own feeling that can be nearly as palpable as the color of the paint on the front of the house. As a kid I remember being particularly attuned to the different feelings that my friends’ homes elicited in me: Some homes felt sadder than others; some felt more controlled; some felt emptier. There were some homes, and some families, though, where it felt like everything was exactly as it should be. These homes felt warm and comfortable, safe, lively, and full. I wanted to return to them again and again. And so when I think about the feeling (besides relief at not having to play “diner” anymore) that our friends took with them on the trip back to New York, I hope that’s it: a feeling of having visited a place where on balance the good parts of life are more evident than the things that make us scared. *Update: It was the same German exchange student who watched a tearful Jay last weekend; this time, he fell into hysterics the second she walked through the door. Caroline tried to comfort Jay and Jay told her that he didn’t want any playtime—he just wanted to go straight to sleep. It was a little embarrassing. This entry was posted in Stories & Reflections and tagged friends expecting child, friends visiting, sharing children, the feeling of a home by Kevin Hartnett. Bookmark the permalink. I really enjoyed this post. The joys (and pains!) of fatherhood can be very lonely. It’s nice to hear how someone else navigates these unfamiliar waters.